Thank God for the victories, testimonies, miracles ,signs and wonders provided for us in the past 60 yrs of existence of RCCG worldwide. Thank God for the blood of Jesus Christ and the power of the Holy Ghost and His promises that guarantee our victory in battles over the year. Thank God for the expansion of RCCG UK and RCCG worldwide the new structure -its unity and peace. Thank God for our Daddy the General Overseer for keeping Him for the past 70yrs. Thank God for the UK and the events that will take place this year( Royal Coronation celebration, the Olympic, etc. Thank God for revival and spiritual awakening in the UK. Thank God for RCCG programmes FOL, OMC, RCCG Workers’Rally, etc in this year of a New Thing. Father, thank you for making all things go well in 2011 in all RCCG churches. Father, thank you for the Church Plants and increases in 2011. Father, thank you for numerical growth in all RCCG Churches in 2011. Father, thank you for peace and tranquillity experienced in all RCCG Churches worldwide. Father, thank you for the special grace and strength you gave Daddy G.O and the Leadership in 2011. Father, thank you for the success of all RCCG programmes in 2011. Father, thank you for the prophecies you’ve given us in 2012 and the fulfilment of them all. 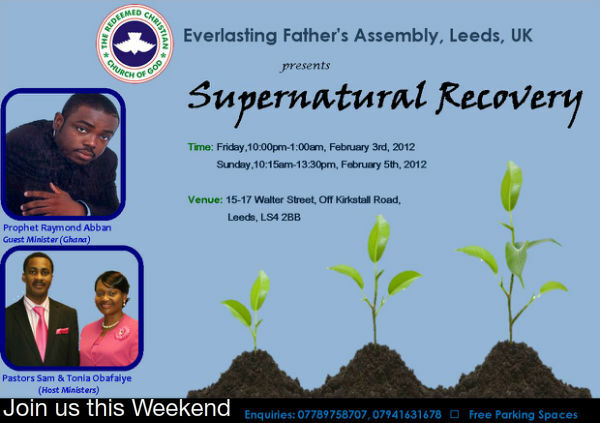 Father, we thank you for uncountable miracles, signs and wonders experienced in RCCG in 2011. Father, thank you for Daddy G.O, Mummy G.O, their family and the protection experienced in 2011. Father, we thank you because 2012 shall surpass anything we have ever experience in RCCG, in word, increase, increase, miracles e.t.c. FOR THE NATION U.K -Mt 6:9-10, James 1:17, Ps122:6, 1s 54:17, Is 44:24-27, 2 Chron 7:14, Is 61:11. Daddy, let everyone waiting for the fruit of the womb receive their miracle babies this yea as you terminate all forms of barriers in Jesus Name. 5. Oh Lord, let every troubled, unstable and difficult marriages in RCCG membership be healed this year and grant them new wine. Father, in this 2012 fast, let every eligible single waiting for marriage be located this year and let there be marriages in Jesus Name. Daddy, by prophecy, let family histories of RCCG members be re-written this year in Jesus Name. Daddy, let there be an end to family premature death in Jesus’Name. As you have prophesied, let our members experience the massive transfer of wealth this year in Jesus’Name. Father, let there be an excellent spirit upon our members, academically. Let our students and professionals be above only and never beneath in Jesus Name. 1. Daddy, this year, hasten to perform your promises in my life and family. 2. Father, let there be an unusual outpouring of your blessings upon our life and my household. 3. Daddy, keep me safe, holy, and sinless this year that I may please you in all I do. 4. Father, let 2012 be “A Year of New Things”for me in every ramification in Jesus Name. 6. Daddy, let every delayed blessing of mine be released speedily this year. 7. Oh Lord, wipe away my tears and usher me in a New season of laughter, joy and power. 8. Father, scatter and put to flight every confederacy of hell against my destiny. 9. Daddy, throughout this year 2012, let the blood speak for me, my household etc. 10. Oh Lord, shorten the distance between where I am and where I ought to be this year.